Black Ice Software - Document Converter version 1.20 is released! Document Converter version 1.20 is released! Document Converter Server version 1.20 is released! Added searchable PDF, editable HTML and XML file format support for Document Converter Server, for parallel document conversions! Black Ice Software has released the Document Converter version 1.20. Added feature of converting documents to searchable PDF file formats in parallel using multiple printer drivers. The new PDF support in version 1.20 of Document Converter Server can be used to monitor a directory with subdirectories to batch convert documents such as Microsoft Office Documents (DOCX, DOC, DOCM, DOT, DOTX, TXT, RTF, XLSX, XLS, XLSM, XLSB, CSV, PPSX, XPS, PPS, PPSM, PPT, PPTX, PPTM, Visio), HTML, PDF, Image Files (TIF, JPG, JPEG, BMP, GIF, PNG, DCM), AutoCAD (DWG) files, Email files (MSG, EML), EMF to PDF simultaneously. The latest Document Converter Server also can be used to apply Watermark, Header, Footer, Annotation, Bates Numbering and Barcodes on the printed PDF documents, or to apply compression to reduce the size of the PDF documents. 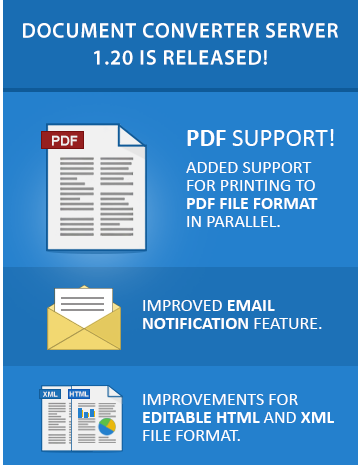 Version 1.20 of Document Converter Server also includes an improved Email Notification feature, to send an email if the conversion has stopped, if error occured during the conversion or if the conversion has completed. Download the Latest Document Converter Server!